"It was a ten hour round trip (back to Guelph). But you know what, I had such a passion to realise my dream to be an Olympian. As a woman I was so excited that the doors opened up (with the marathon) so I never considered it a sacrifice. Never thought it was a sacrifice." "When I wrote that dream I never thought about the cost. I never thought whether I had the ability. ... I thought the only thing that would keep me from achieving the dream would be my own unwillingness to work hard enough and give enough. So that was always my mindset. If I work hard enough and am willing to make those sacrifices I would see that dream realised." "... When people would say what did you give I would say, what did I not give?" - Canadian marathon record holder, Silvia Ruegger, talking about how in preparation for the 1984 Olympic Trials she used to travel from Guelph (where she went to school) to Toronto by Greyhoud to subway to bus twice a week to join her coach and training group for workouts. Ruegger finished 8th in the 1984 Olympic marathon and qualified in 1988 despite having a severe car accident in 1985 which limited her running for two years. If you had to eat the rest of your meals at one national chain restaurant for the rest of your life, what'll you choose? Bernard Lagat 70 MPW. What could he do with more mileage? Provisional Entries For Zürich DL This Thursday David Rudisha and Yuliya Zaripova, a deep women's 1500 and stacked men's 5000 highlight. Duane Solomon, Shannon Rowbury, Jenny Simpson all competing. Thursday's Zurich 5000 Has 7 Of The Fastest Men In The World This Year And 5 Of The Top 7 Finishers From London Led by silver medallist and world leader Dejen Gebremeskel, the field has Hagos Gebrhiwet, Isiah Kiplangat, Yenew Alimirew, Thomas Longosiwa, John Kipkoech, Tariku Bekele, Bernard Lagat, Galen Rupp, and Lopez Lomong. *MB: Stacked Zurish DL 5k!! 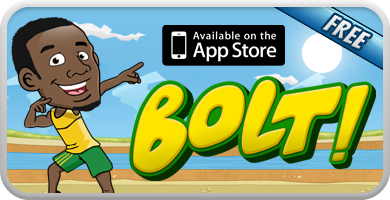 Could We See Usain Bolt On The Big-Screen In The Near Future? 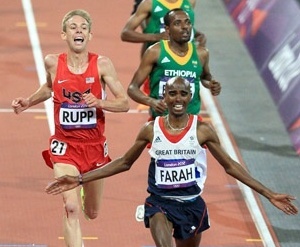 LRC: Mo Farah Wins Final Track Race Of 2012, Centro, Leo Disappoint, Merritt Keeps Rolling Post-Olympic fatigue seemed to be fully in play as the meet was full of lackluster results, as Mo Farah won the 2 mile in 8:27, the men's 200 was won in over 20.00, the men's steeple was won in 8:20, the women's 800 was won in over 2:00, and Anna Pierce won the women's 1,500 in 4:11. 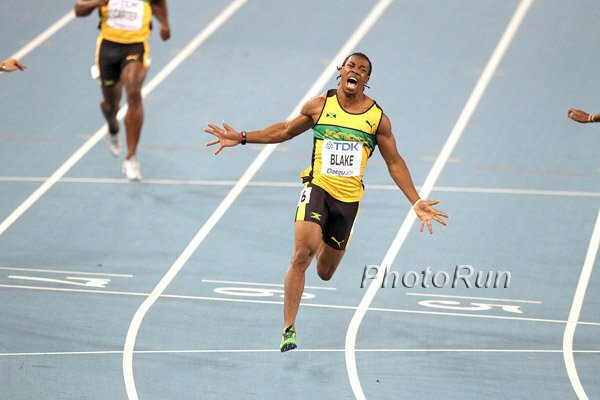 Aries Merritt did win a quick hurdles and Carmelita Jeter beat Shelly Ann Fraser-Pryce again. RR1: Silvia Ruegger Still Has The Canadian Marathon NR From 1985 (2:28:36), But Thinks It Could Go Down At The Toronto Waterfront Marathon On Oct. 14 "When I wrote that dream I never thought about the cost ... I thought the only thing that would keep me from achieving the dream would be my own unwillingness to work hard enough and give enough....When people would say what did you give I would say, what did I not give?" RR2: Science Of The Sport Looks At The Lance Armstrong Case And Breaks It Down Piece By Piece For those who still defend Armstrong or those on the fence and not sure what to think, this is a must read. It addresses the most common questions and positions people have raised when it comes to USADA's case against him such as "But he never failed a test" and "Why bother with testing if it doesn't work". Penn State Alumni Started Their Attempt Yesterday To Break 1,000 Mile Relay WR For Kevin Dare Foundation Ryan Foster leads a team where each runner will run 5 miles and then get a 4 hour break before having to run again. 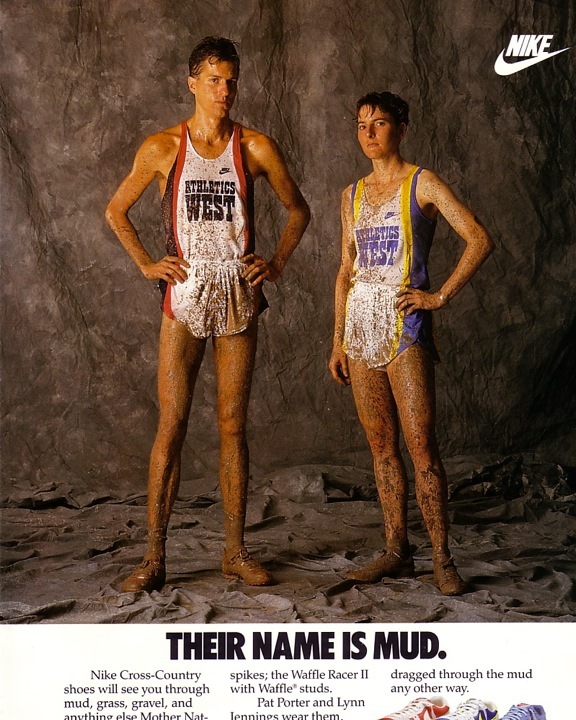 They have to average 5:57 pace. IAAF Recap Of Swedish National Champs Johanna Lehtinen won an unusual 1500/10,000m double (4:18/33:25). UK Paralympic Cycler Lashes Out At Paralympic Track Athletes "There are some sports which just have a laugh...The para-cycling team won 17 gold medals and three silvers in Beijing from a squad that was only 13-strong. Athletics had 30-odd people there and they won two golds, so where's that money gone? Scrap all their funding, give it to cyclists and we'll win double the medals we do already." Ireland's Independent: Master Of Denial Sees His Epic Fiction Ripped To Shreds "In his heyday he would cycle himself to a standstill in the Alps. He ultimately lied himself to a standstill too. His final statement was one last sad and desperate fiction. It was the flag on the summit of a mountain of lies." "It's not about the bike. It's not even about the drugs. It's about the truth." "Perhaps there are a few deluded souls out there who'll seek solace in the fact that Lance Armstrong never tested positive. Well, neither did Marion Jones." French Anti-Doping Agency Official Claims Armstrong Always Received Advanced Warning Before He Was Tested So He Could Prepare Lance Armstrong: "Nobody needs to cry for me, I'm going to be great. I have five great kids and a wonderful lady in my life. My foundation is unaffected by all the noise out there." This Is A Problem: Colunist: Armstrong's Image Won't Be Hurt Because "Drugs and doping have become so commonplace now that the public is increasingly blasé about them." IAAF Does A Profile Piece On Leo Manzano They seem obsessed with his height, as it opens with "Manzano may carry a pint size stature but the Olympic 1,500m silver medallist proved he has a heart as big as his much taller rivals ... At five feet five inches tall, Manzano was dwarfed by his opponents..."
Andrew Wheating Returns Home To Vermont For A Brief Vacation And Says He Knows He's A "Top Five Competitor In The World" "I'm still young and I've got one more Olympics in me. My peak years are 27 to 29, and I'll be looking to capitalize there." Donn Cabral Says He'll Probably End Up In The "Pacific Northwest" That most likely means Evan Jager will be getting a new training partner at the OTC. LRC: Matt Centrowitz Runs 3:31.96 For Third The twenty-two-year-old American continued to roll as in his first race post-London he skipped the 3:32s and 3:33s to run 3:31.96 and come close to the win in Lausanne. 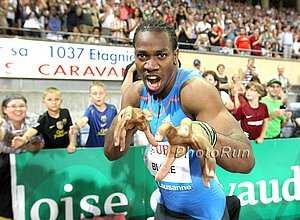 Results: Yohan Blake 9.69, Usain Bolt 19.58, Pamela Jelimo Over Mariya Savinova, Matt Centrowitz 3:31, Leo Manzano 3:34, Galen Rupp DNF The two Jamaican sprint stars came to play in Lausanne. 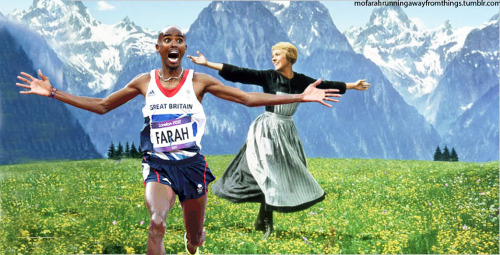 But the mid-d and distance action left you wondering how the Olympic results were as they were. In the 1,500, the American silver medallists didn't really show up as Leo Manzano was 10th and Galen Rupp didn't finish, as Silas Kiplagat got the win and Matt Centrowitz showed why he's the best American miler when healthy. In the women's 800, Pamela Jelimo got the win over the 2012 Olympic champion, and in the 3,000, Jenny Simpson was dead last - proving in our minds that her problems in 2012 aren't a matter of confidence or tactics, but rather fitness. 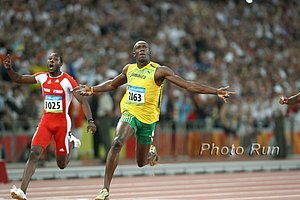 Show Them The Money: Yohan Blake Says He Raced Despite Being Sick All Week Blake also admitted not racing Bolt has to do with money: "I would run with Usain any day, he's my training partner. 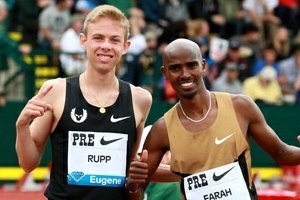 I would love to run with him, but they have to put up big money." 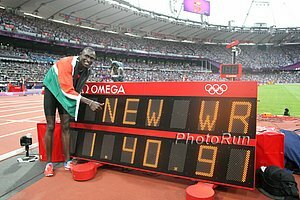 Greg Rutherford Says He Could Beat Usain Bolt "Easily" If He Ever Switched To The LJ Pretty cocky statements from the man who had the shortest gold-medal-winning leap in 40 years. 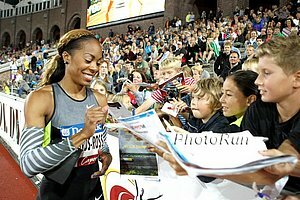 USATF List Of All US Performances From Lausanne: Dawn Harper And Jason Richardson Win Sprint Hurdles Aries Merritt was DQed for a false start; David Oliver was a close 2nd to Richardson. 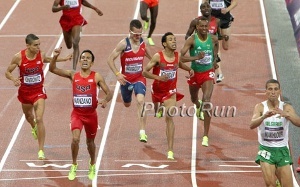 *MB: Donn Cabral at Lausanne and his future He was 10th in 8:31. Qatar's Moutaz Essa Barshim Ahmed Wins Lausanne HJ In 2.39m, Olympic Champ Ivan Ukhov Was 2nd And UK's Robbie Grabarz Was 3rd, Tying The UK NR (2.37) French Olympic PV champ Renaud Lavillenie won over Germany's Malte Mohr and UK's Steve Lewis on countback. 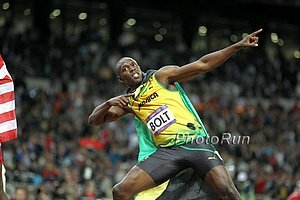 100 Final: BOLT: Tim Layden: "In many ways, this one was better." 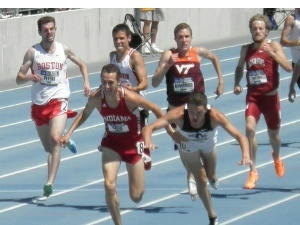 (link fixed) If you ever thought there was a better short sprinter in the world think again. 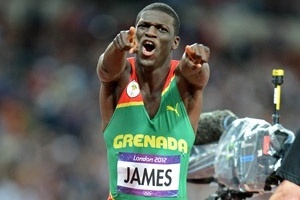 Usain Bolt delivered on the biggest stage once again in the gretest 100m final ever. All 8 men would have broken 10.00 but Asafa Powell, the man who has gone sub-10 more than anyone else in the world, pulled up before the finish. 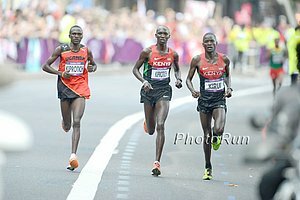 W Marathon: LRC Tiki Gelana Wins 2012 Olympic Marathon As Shalane Flanagan And Kara Goucher Finish 10th And 11th The star-studded field featured Mary Keitany, Edna Kiplgat and Liliya Shobukhova, but in the end it was the marathon's new star Tiki Gelana who got the win. 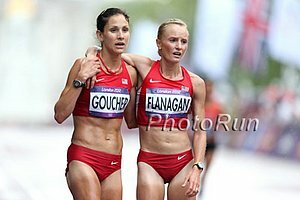 American Shalane Flanagan was 10th and teammate Kara Goucher 11th. 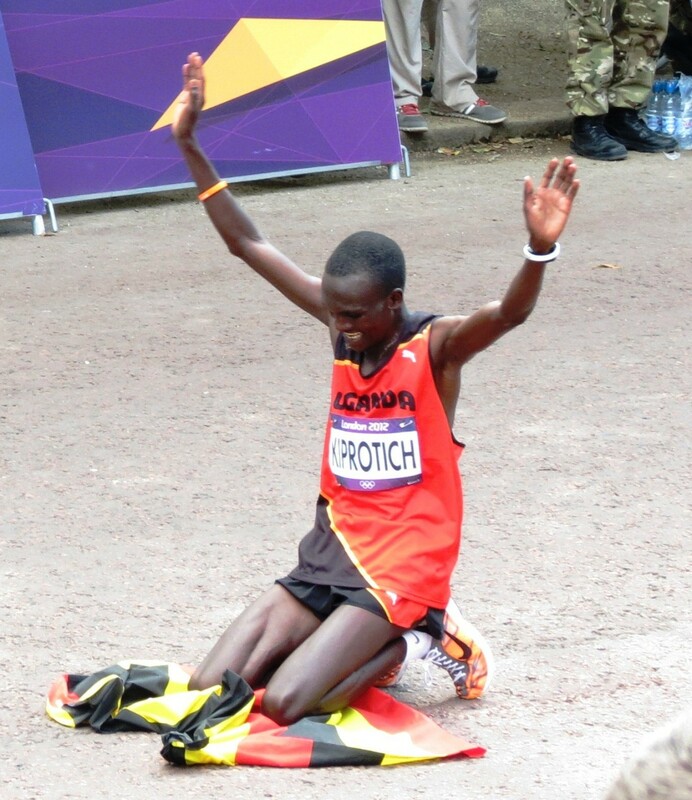 LRC analysis, recap and more from London. Russell Brown Interview Who's Still Rehabbing From His Injury Which Kept Him From A Legitimate Shot At Making London 2012 "Growing up in New England, you just learn to embrace the weather. By the time I was ready for college though, I had done enough embracing. That’s why Stanford was such an easy sell."